Selecting your lenses and frames is a very personal choice. A wide variety of options are available that can be tailored to suit not only your vision need but also your fashion preferences. Highlight your features, play with color, and augment vision for different functions such as reading and playing sports. With all the choices available, the experience can be daunting without the right guidance. Dr. Lisa Bunin’s knowledgeable staff can assist you in making the right choices and ensure that you will be completely satisfied with your glasses. Acuity Optical Center offers the convenience of one-stop shopping for your eyes at our Allentown, PA office. Once you have had your eyes examined, you can have your prescription filled to the exact specification without leaving the office. We offer the latest lens technology and you will find our wide selection of high quality and fashionable frames will suit even the most meticulous taste. If you are a sports enthusiasts, we have the frames to keep you safe and in the game. Love being out in the sun? All of our frames can be made into sunglasses. We offer all of the designer frames but can please the budget minded as well. After you have made your selection, we will accurately fill your prescription using the highest quality materials. Whether you have worn glasses for a lifetime or this is your very first eye wear purchase, Acuity Optical will give you “one of a kind” service, selection, and quality. If you’re a parent in search for the right pair of eyeglasses for your child, you probably know that walking into an optical store can be confusing. With all the choices how do you know which ones will be right for your child? 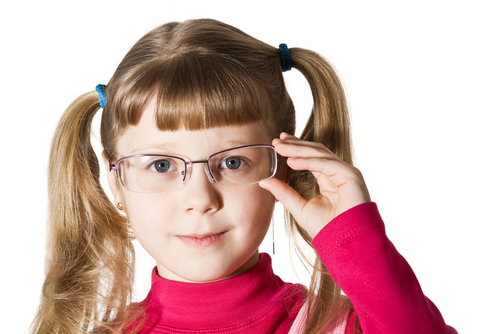 Children who need glasses are either nearsighted of farsighted. Depending on the degree of visual correction, the optician at Acuity Optical Center will prescribe glasses for full or part time wear. Now for the fun part, selecting the frames with your child. Be sure to let your child be involved with the decision. Acuity Optical will help in eliminating obviously wrong choices, so let your child enjoy trying on different styles and colors. Polycarbonate is the material used for sports eye-wear. You can have your child’s glasses ordered with this material. However, regular frames do not provide enough protection from large objects such as balls and flying elbow. If your child is active in sports, a proper sports goggle with polycarbonate lenses will provide the best protection against eye injury.